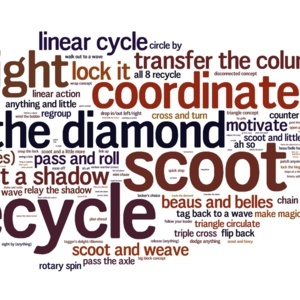 This "Wordle" is an illustration of how frequently calls written by Lee Kopman appear in modern square dance calling. The size correlates with the frequency of the call's use, Readers interested in knowing more about Lee Kopman will enjoy listening to the interview conducted with him by Bob Brundage and posted on the website of the Square Dance Federation of New England. Clark Baker, “Lee Kopman calls,” Square Dance History Project, accessed April 24, 2019, http://squaredancehistory.com/items/show/1686.